Take advantage of fresh fall produce and make this honey ginger pear butter. Slow-simmer pears with honey, ginger, and warm spices for a delicious spread. Place chopped pears in the bowl of a food processor fitted with a knife blade. Process until smooth, stopping to scrape down sides as needed. Combine pear puree and the remaining ingredients in a medium saucepan (non-stick recommended). Bring to a simmer and cook over medium-low heat until mixture is thick, about 2 hours. Stir about every 20 minutes during the cooking process. Remove vanilla bean, scrap the seeds from the vanilla bean and stir seeds into the pear butter. Discard outer bean. 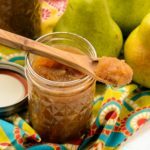 Transfer pear butter to storage jars or containers. Cool to room temperature. Cover and chill thoroughly.